Let the record show: in terms of politics, I lean towards the Right. My family, which hails from the holiest seat of Hinduism, Varanasi, has had connections with the RSS since it arrived in the city. 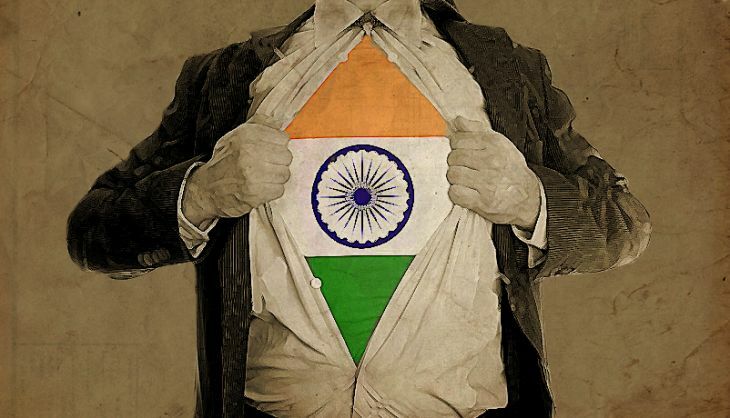 I am a proud Indian, a proud (if not a temple-frequenting, devout) Hindu, a milk product-loving vegetarian, and, as my surname shows, a Brahmin (who doesn't believe in the primacy of one set of surnames over another) born into a decent amount of privilege. Read: BJP goes national against JNU 'anti-nationals'. Will the fire spread? Since figuring out my Left from Right, I have believed in the latter. I feel that the free market, despite its inherent flaws, is the better economic strategy to follow, and that what this country needs more than anything else is to make all its people truly equal by enacting a Uniform Civil Code, something the BJP promises. On the other hand, to my mind, the ideology the Indian Left peddles is either outmoded (CPI, CPM) or blatantly self-serving and anti-people (Maoist). History shows us that Communism has been a failure without the use of force. I believe the poor and underprivileged of this country, irrespective of first or last name, need a leg up and not a crutch. Which brings us to what happened in JNU and its aftermath. For over a decade since my days as a student of the University of Delhi, I've taken great pride in mocking JNU as a relic of the Left movement. In the present instance, I maintain that the slogans that were chanted on the JNU campus that fateful day, were unacceptable. Unacceptable in terms of the fact that I didn't like them. Unacceptable to me, because I believe I belong to a great nation, and I will take exception to anyone who promises to divide it into a thousand pieces. But not unacceptable in terms of sedition charges against the moderate Leftist students' union president (who didn't even do the chanting); Jaish-e-Mohammad murmurs against an extreme Leftist/atheist who happens to have a Muslim name; lawyers attacking journalists outside a court house for reporting facts; and a police commissioner who spouts poetry borrowed from a film song after all that has transpired. Over the last week, I have shied away from Facebook and Twitter. All I see is JNU: anti-national, Kanhaiya, Umar, Bassi, Arnab, and Patiala House violence. All I see is name-calling: bhakts, libtards, sickulars, presstitutes, more anti-nationals, gaddaar and deshdrohi. And then came a Facebook post from an acquaintance who has often been vocally pro-Narendra Modi and BJP, or as they are called nowadays, a 'bhakt'. "Some people chanted anti-national slogans in JNU. JNU should be shut down. There was some month-old bread in my fridge that was stinking. I've thrown out the fridge." It was then that it hit me: we who lean towards the Right without agreeing with the RSS on every matter have no leg to stand on today. We have to choose sides - the 'bhakts' or the 'anti-nationals'. Is it wrong to be proud of the history of India - of the Mauryas, the Guptas, the Chauhans and the Mughals? Is it wrong to believe that we gave the world the basis of today's Science and Mathematics? Is it wrong to believe that neither Gandhi nor Nehru, or even Ambedkar, was perfect in every way, but that parts of each of their philosophies and policies made India what it is today - the world's largest democracy? As humans our ability to debate and converse adds to the essence of life. Why stifle it? Is it wrong to be a proud Hindu, one who believes that this religion, with its roots in nature, offers greatly plausible answers to the imponderables of Life? Why then, is being branded a 'right-winger' such an abuse? Why can't I believe all of the above, and still be considered fit for intelligent human company? Why must I be clubbed with every loon who shoots a Dabholkar, Pansare or Kalburgi? Why must I be called a descendant of Godse? Do I label every Leftist a Maoist? On the flip side, why has Rightist ideology boiled down to hatred? Why must anyone who disagrees with me be sent to Pakistan? Why must I see a Muslim or a Christian as 'the other'? Why must I despise a homosexual person for what he or she does in the privacy of his or her bedroom? My wife and I adopted a dog a year ago. Since then, we've come to a better understanding of animal behaviour. Animals mostly react in a predictable manner. Whether it is my pet or a stray dog, it will have the same impulses - protect its territory, attack if threatened, find food and mate when in heat. Human beings are different. Not all of us react the same way when put in the same situation. Our ability to converse stems out of this: each one of us has a different impulse, a different reaction, a different thought. Imagine a conversation where everyone has the same perspective and they all agree with each other. How long would that last? I am not Umar Khalid. I am not Kanhaiya Kumar. I didn't know them from Adam till last week. But, if I were to meet them and have a conversation, I would argue with them on our differing political views. I would try to make them see sense in the benefits of capitalism , but I don't think that would work. They would probably try to convince me that socialism can trump capitalism as an economic system, but they probably wouldn't succeed either. So what are we to do? Harbour a grudge? Beat each other up? Or simply move on with our lives? By slapping a sedition charge against Kanhaiya, the present Rightwing establishment has scored a self-goal. By all means, find the people who shouted anti-India slogans, and take action against them, whether at the level of the University administration or the police. But don't label a guy defending the right to dissent and free speech, a moderate Leftist belonging to a nationalist party, a 'deshdrohi'. I have two messages to deliver. The first is to my fellow Rightists. I am proud of what you are proud of, and I agree with some of the things you demand. The fact that I don't agree with you about everything doesn't make me anti-national, or a libtard, or a presstitute. The second is to the people of JNU and those standing in solidarity with them. Please continue the good fight. I need you to argue and debate with me, so that we can continue the conversation that makes us human. We, the Right-leaning, (slightly) sane people of India need you, more than ever. I don't want to be the new Left to this new Right.